As you may know, our group specializes in various mediums including watercolor, color pencil, acrylic, oil, and pastel. Each one of our members typically focus in one (or more) of these mediums. In this blog we will be exploring the different mediums of painting and drawing that our members use the most. To start off, we’re going to talk about one of my favorite type of art mediums; watercolor. I’ve always admired how delicately beautiful water colors can give to a painting. There is such incredible potential to layer these stunning colors as the opacity of the color is dependent on how much water you mix in with them. Most watercolors dry up lighter than their application as well which is what (I think) gives their illustrations a gentle, radiant-like glow. Growing up, I have always had a package of colored pencils ready for my next sketch. My love and admiration of art had started from a young age as I realized the endless shades of colors you could get from a single pencil. Depending on the amount of pressure you press each pencil down, you could create a plethora of colors with a single colors pencil. Isn’t that amazing? Acrylic paint can deliver an astounding effect on a blank canvas. Similarly to watercolors, acrylics can also be thinned down with water and create a stunning effect on a canvas. Along with their speedy-drying time, they have demonstrated to have more “staying-power” than other mediums of paint. Acrylics can also be mixed with other add-ins to create a different finish. For example, acrylics can be combined with a gloss medium to have a jewel-like finish which can add more life to an illustration. I’ve always found that oil paintings have delivered a more elegant, timeless finish to any sort of art. That may have been because oil painting has been around since the 5th and 9th century. Did you know that oil paints were originally used to decorate shields and other objects in western Afghanistan. It was later discovered that painting on a canvas allowed pigments to hold up much better . Last but not least, we’re going to talk about pastel colors. Although I haven’t seen many artists use pastels to create their drawings, the drawings I have seen always looked chic, yet classy. There are several types of pastels available in the world that can give off a unique finish to each image. There are soft and hard pastels, pastel pencils, and oil pastels – all of which are spectacular on canvas as they have a higher proportion of pigment; thus resulting in brighter colors. I hope this blog has enlightened you a bit more on the different forms of art available and has expanded your understanding on these mediums. 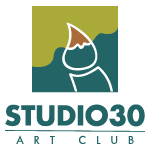 We’ll talk more again in the next post but for now I hope you continue to explore the world of art with us at Studio 30.